Drew: I regret that this quote is so critical of the documentary format, since my takeaway isn’t that it’s “easy” to be funny using that format, but that the format itself is well-suited to comedy. (Honestly, it’s hard for me to imagine caring about how easy or difficult a joke is to tell — I just care if it’s funny.) Indeed, I’d argue that selecting the format that best tells the story is of the upmost importance, and a format that is funnier and faster is ideal for a series like West Coast Avengers. In many ways, the documentary format itself — represented in this issue by the confessional sequences delivered directly to camera — sets the pacing for this issue, establishing six square panels as a kind of heartbeat for each page. Writer Kelly Thompson and artist Stefano Caselli end up playing with that tempo as needed, but let’s start with how they first establish its regularity. It helps that those six-panel confessional sequences have already played a key role in the series thus far, but they use it to great effect in this issue, allowing Thompson and Caselli to precisely pace their jokes. I mean, this sequence is remarkable for a number of reasons — Thompson’s command of Kate’s voice (including her ringtone choices), Caselli’s command of Kate’s expressions, and the fact that we can just kind of dwell on this moment of anxiety with Kate. These are all facilitated by that confessional format, letting the creative team do their thing so we can luxuriate in the unbridled Kate-ness of this sequence. But what I want to highlight here is how the regularity of this repeated shot sets an almost metronomic pace. Six equal beats, and there’s a lot of humor to be mined from simply pulling the character tighter to the camera or dropping down to a single line of dialogue because the format sets very clear expectations for what these panels should look like. Caselli adds a few more panels, but we can still see the six-panel structure, with the first two rows mostly playing by the rules, and the last one even ending with one of those confessional shots. But in cramming in those extra panels to the last row, Caselli makes those shot/reverse shot panels smaller, which in turn makes the subjects feel larger and the moment feel quicker. It’s a clever way of simulating the furtive first glances of a budding crush (which is quickly and hilariously undermined by another reverse shot on Ramone’s cat). It’s easy for me to stretch that six-panel pacing to talk about every page — I’ll point out that the big double-page-spread in the middle of the issue has six panels — but I really do think the frequency of the six-panel grid in this issue sets up a rhythm that gives Thompson and Caselli a lot of room to play with. Even in sequences with decidedly fewer panels (like the very first and penultimate pages), the comedy works largely because we read those widescreen panels as having two beats — one for each subject. Spencer! Before I devolve into complete self-serving abstraction, I’m hoping you can pull us back from the brink. I was fascinated by the form of this issue, but there’s plenty of content for us to dig into, too. I definitely want to hear your thoughts on the actual events of the issue — but especially if it features six-panel pages. 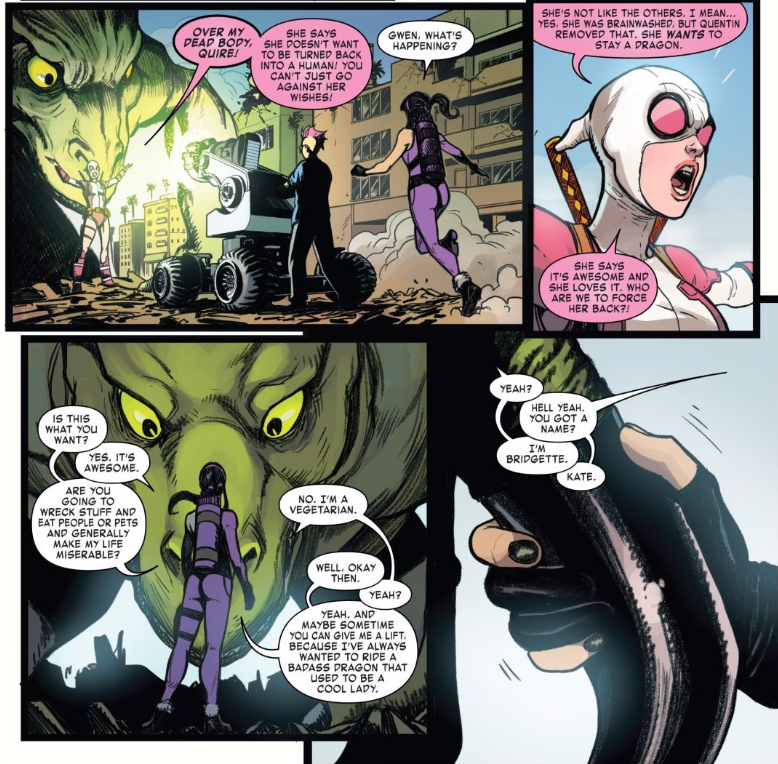 Spencer: I am more than down to talk about the content of this issue, Drew, but now that you’ve pointed it out, I can’t help but see those six-panel grids all throughout West Coast Avengers 4, and there’s a few I want to talk about myself first. It’s a smart choice to base the issue’s structure around the number six because there’s six members of this team, which creates opportunities to split up the characters into multiple configurations while still servicing them all. I like this particular instance because, with half the team present, the six-panel grid allows for multiple reaction shots from each of them. The leap from each character shielding their eyes to their reaction to B.R.O.D.O.K.’s transformation is a fun one, and the six-panel grid gives it space to breathe, all while creating a fun rhythm that reoccurs throughout the issue, giving it structure. 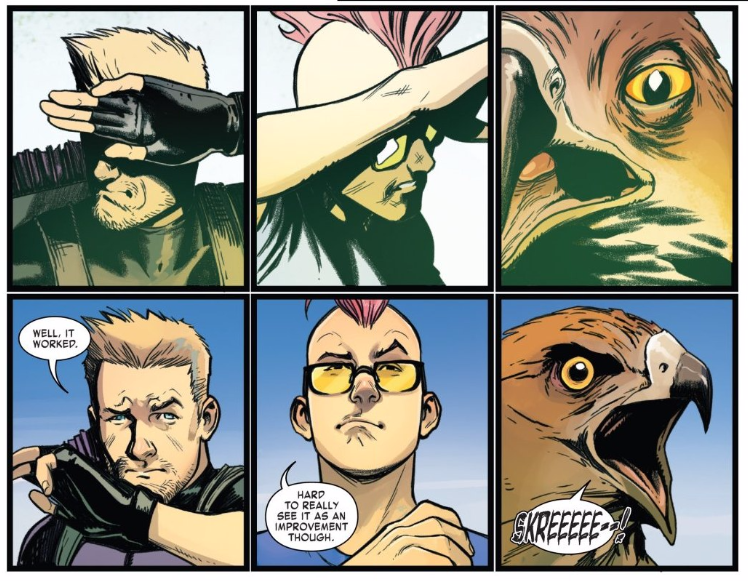 This is my favorite instance of the six-panel grid in West Coast Avengers 4, though. Again, you can split the page’s real estate clean in half between the two groups — Fuse gets three panels and Gwen and Quentin get three panels — but Caselli and Thompson play with the pacing to give their punchline more sting. Switching from Gwen and Quentin to Fuse makes the inevitable cut back to them making out all the funnier — it simulates a camera cut without using a page turn, which would give this moment unearned/unneeded gravitas — without betraying the established visual and narrative language of the issue. Everything about this scene — and essentially this issue — just works. And, as Drew alluded to, that includes the story. As anyone who’s been following our coverage of this series probably knows by now, I’ve found a lot to appreciate about the themes Thompson and Caselli have been weaving into this opening storyline. WCA 4 doesn’t dig into B.R.O.D.O.K.’s toxic masculinity the way issues 1-3 did, but it doesn’t really need to, as those three issues have done more than enough to lay out how truly deluded and harmful B.R.O.D.O.K. and his viewpoints actually are. Instead, after quickly giving B.R.O.D.O.K. a much-deserved comeuppance, the issue digs more into the other major theme of this arc: the kinds of behavior that serve as an antidote to toxic masculinity. On first glance, this scene probably doesn’t seem all that important or essential. It’s a great gag, for sure, and I have to believe that Thompson and Caselli have future plans for Bridgette the Dragon (she’s too cool not to bring back). It’s also a powerful character moment for Gwenpool. After all, Gwen first immersed herself in the Marvel universe because it was awesome and she loved it — her escapism has some serious parallels to Bridgette’s here, and Gwen no doubt sees herself in this woman who doesn’t want to return to her mundane life as a nobody. Of course she’s going to stand her ground and defend her. Still, ultimately, you could drop this scene from the issue and it wouldn’t really affect it, right? Nope; this is quite possibly the key moment of the entire issue. B.R.O.D.O.K. treated Bridgette and the other girls like objects rather than people, altering their bodies against their will and robbing them of their ability to make choices at all. In contrast, Gwen defends Bridgette’s right to choose, and Kate likewise allows Bridgette to make this momentous decision because, well, who is she to tell Bridgette how to live her life? 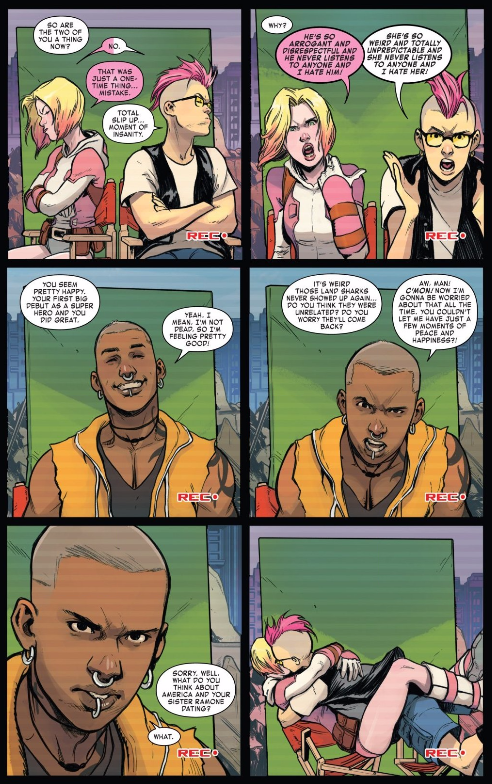 This is the West Coast Avengers once again embodying the kind of behaviors that serve as an antidote to toxic masculinity, just as they’ve done throughout this entire storyline. 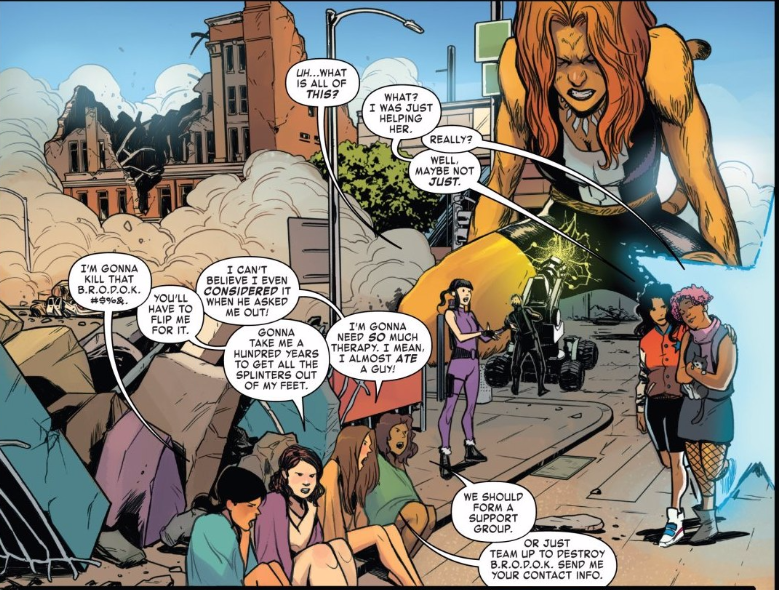 Even Kate and Tigra’s choice to wait until after the battle to undo the transformations B.R.O.D.O.K. put them through is one that returns to them the agency B.R.O.D.O.K. robbed them of, and they’re decisions Clint and Quentin are happy to back. Once again, these behaviors are simple, obvious, and quite possibly the bare minimum that one human being owes another, but it’s a sad fact that they’re rare to find nonetheless, and it’s still aspirational and cathartic to see Kate and company embody them so effortlessly. The rest of B.R.O.D.O.K.’s victims don’t get the attention that Bridgette does, but I nonetheless appreciate that Thompson and Caselli give us this brief moment with them. B.R.O.D.O.K. silenced these women, but Thompson and Caselli give them a voice, a chance to not only vent about what happened to them, but to band together for support. West Coast Avengers (both the series and the team) is respectful both of women and of victims in a way that few people or series are, and it’s not just refreshing, but it makes for a compelling bunch of heroes with a unique, necessary perspective. I haven’t said a lot about this series, as I’ve been struggling to find the time to really dig into it, but I really am loving it. And I love how well this is working as a continuation of Thompson’s brilliant Hawkeye. With the reveal at the end that Madame Masque and Kate’s mother are coming into play, I think it is important that the feminist themes of Hawkeye are also here. This series is working so well as a thematic continuation of Hawkeye, even as the noir elements have been replaced. Especially as Thompson is so good at handling that. I also really appreciated the focus on the women as more than just props. Bridgette especially. Also, I love the layers of the ‘Born in the USA’ joke. The famous chorus already sounds made for Captain America, but the song’s actual themes about disillusionment with America after Vietnam is a perfect match for Captain America’s own themes of critical self examination of America and its failure to live up to the Dream. And then it also references Kate’s argument with Clint back in Fraction’s Hawkeye about Bruce Kulick and Bruce Springsteen. Kate’s still a fan of Springsteen. Which is a cute little extra.